This guide will introduce those to how the game works and how to use its weapons. Jokes aside, these things are murder machines. When a player jumps into one, it does massive damage, and pushes them in a certain direction. They collide with items and objects. Found on Laser maps, they are often on tilting platforms, so jumping on them and pressing S will push them down and make them turn, possibly killing your enemies. Watch out. When you fall off, the laser will rotate towards you. Take care; this thing is like a glass cannon. I do believe these things are self explanatory. They are barrels, they explode. Anything caught in its radius will be damaged, obviously. Upon being shot or colliding hard enough with another object, they will begin to expand and contract, exploding after 5 seconds. Fire at them if you are far away enough and a player is next to them; the resulting explosion will deal quite a bit of damage. Self explanatory. Barrels that spawn snakes. As long as you keep the opposition down where snakes spawn, there is a chance that enough will spawn that they will be stuck and die a slow and painful death. There are only two instances (as of now) of this thing, both on the Castle maps, both moving. Shoving a player into one of these or tricking them into being nailed by it, it will instantly kill them. This thing doesn't want YOU to win of course; its here for blood. It can always swing back and kill you, or roll over and crush you. Be cautious when fighting near a stationary ball, if you manage to make it stop moving; you can accidentally punch and send yourself into it. This things cannot do any damage themselves, and often don't collide with players. However, they block bullets, but upon taking a single bullet, the collision point with the bullet and the chain breaks. This can be used to make platforms fall, make them unbalanced, and even crush someone! However, all these things can happen to you, so be careful of where you shoot, otherwise your own traps might be your literal downfall. These things are practically indestructible, but are easily pushed if on towers or if they are small. Found on Factory and Desert maps, they can crush enemies, doing bits of damage, they can unbalance platforms making players fall off, and can be used as cover! Careful, though, since they can be pushed off an edge, and if you are behind them, can carry you along. Thats right, friendo, people aren't even safe from TREES! Since ducking is almost useless, since you dont duck on other people's screens, hiding behind trees are a good alternative. If you are lined up just right, they can be helpful, so you can ambush your enemies just when they think they are safe! However, one warning. If they saw you hide, they can take advantage of the fact you are a still target, and its even worse if you are next to an edge, since they and shoot/punch you off! So, this is a thing. Upon first glance, it must look very hard to control, right? Thats because it is! Considering the massive amount of recoil it has, its not only hard to aim, but it can send you off the map! The best thing to do is to aim down, jump, and hold down the fire button. It will send you into the air and rain fire and brimstone upon your enemies! Well, its more like lead and gunfire, but who cares? Its a minigun! The snake variation will let you glide for a second, but it wont work for too long. This weapon will fire glowing projectiles. When these shots collide with a player or object, it will turn into a bubble the size of the player, with its center being the site of collision. Anything caught in this bubble will be held, however the entity grabbed may escape if it has enough speed. Upon bursting, it will deal damage to anyone caught in the bubble and fire them off. On more than one occasion did I get fired into the atmosphere by this thing. I think it's self explanatory. When used, it will launch flames out of the barrel. These flames will stick to anything it touches, which leads me to believe it shoots napalm. Even though it deals just barely noticable damage, if a player takes a full round from a flamethrower, they will die quickly, even at 300 health. It curves too. A good tip; use it to actually rain fire and brimstone by pointing it up and firing. Make sure you don't get some on yourself though. This weapon launches relatively slow-moving rockets that explode on impact with anything. If you can time it just right, you can fire a missile right into someone's face, basically to the point where they are eating the thing. It will deal massive damage and will probably kill them instantly, unless they have 300 health. Use these on Winter maps to screw over enemies below/on the ice platform you are shooting at. Heck, you might just be able to propell yourself off the ground with its explosion! Basically the normal laser except you can kill yourself easier. This thing launches a projectile that moves slower than the RPG's missile. It can be moved while its flying, but the moment it touches anything that is not a player, it will be stuck in place. After 1 second when it is deployed, it will fire a continuous laser that only another object like a box or a gun can stop. Use this to kill people on flat grounds below you, or to trap them. It also causes lag, so if you want to kill computers, you can do that, I guess. 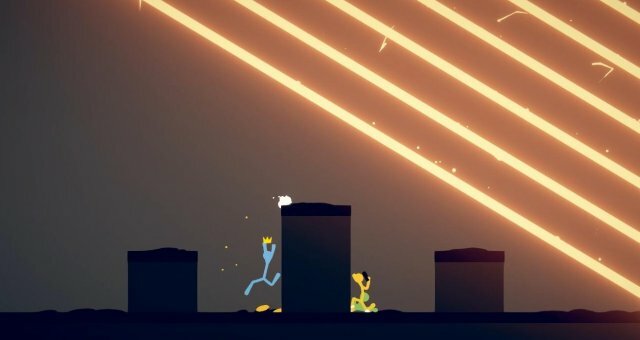 Snakes are among the most deadliest thing in Stick Fight. One cant do much, but about 3 will make it difficult to get them off you. These are basically portable Snake Barrels. 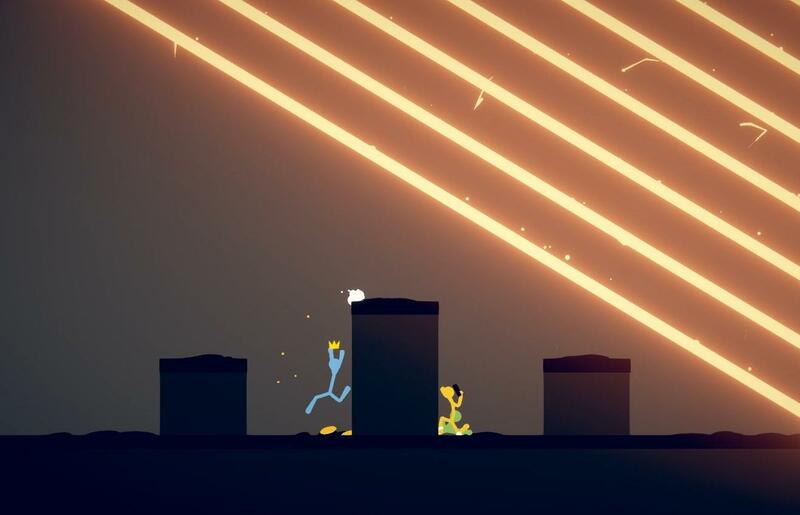 Use basically the same strategies you would with the Snake Barrel, except you can move the snakes; Place snakes in pit with player, watch them get devoured. This also has the same threats as the Snake Barrel; you can fall into your own trap. The Snake Launcher launches giant snakes that are good at pushing players and anything between its prey and it. It also does more damage, but it barely lands hits on players. Oh and by the way, how does it shoot that stuff? Wouldn't it get stuck in the barrel? A (supposedly) western weapon with high recoil and high damage! In order to compensate for the recoil, you have to wait a bit after firing to get your shot lined up. Its like a sniper without the laser, since it is about as accurate as a sniper. Speaking of which, the sniper and revolver have pretty high knockback, so try to shoot enemies while they are in the air! The weapon with the most kickback in the entire game. Its like a semi-auto minigun! Aim this thing at your targets and fire! Watch out though, don't fire this beast too close to the edge, or the floor of a pit is gonna catch you. This is useful for propelling yourself across edges and into the sky, and does a large amount of damage if all bullets hit.